At the same time that the announcers voice rang out in the packed Saineikan dojo, the two competitors and the three shinpan faced the throne and bowed deeply to the emperor and empress. Both competitors stand up and kiai with all their might. The small Takizawa adjusts his kensen slightly up to make up for the difference in height between him and the taller Abe, who lowers his for the same reason. With their kensen moving rhythmically, they slowly close distance. You can feel the pressure radiate out from both mens shinai, like electricity. Over a few years, Takizawa Kenji sensei (kyoshi, 8dan) has been making trips to Europe, and has met a few of my friends (and probably lots of kenshi247 readers) while abroad. Although I don’t know him personally (yet), I have been training with his younger brother (Takizawa Masaya sensei, kyoshi, 7dan) for the past few years. Recently both brothers went to Barcelona for a kendo seminar and this inspired me to introduce something about their highly influential father to kenshi247.net readers. Please note that I got Takizawa Kenji and Masaya sensei’s permission to write this article, including translation and use of published as well as private material. Although he started travelling back-and-forward to Shudogakuin at 19, he was forced to suspend this for 2 years, so it wasn’t until he was 21 when he entered the dojo officially as a live-in-student. For 4 years he lived in the dojo (cleaning, washing, and cooking as well as practising) and studied kendo and itto-ryu under Takano Sasaburo. Keiko at the dojo was rough, with people being routinely shoved to the floor violently and water thrown over them to be revived. Many kenshi that came from the outside to practise (i.e. not full-time, live in students) were shocked at the roughness of the dojo and fled. In 1936 (presumably due to Takano’s efforts) Kozo entered the Imperial guards and his main place of practise became Saineikan in the imperial grounds. This time in the imperial guards kendo history is referred to as its renaissance period, as they had a group of strong kenshi and had lots of shiai success. Although he now practised at a different dojo he would remark years later that it was his years at Shudogakuin that he forged his basics. After many years of working as an imperial guard, he was transferred in 1953 to Police HQ with the job of re-formulating police kendo for the new period. Just prior to being transferred out of the imperial guards, he had his three sons start kendo at Saineikan. At that time they were 9yrs old (Takizawa Kenji, now kyoshi 8dan), 6yrs old (Takizawa Masaya, now kyoshi 7dan), and the third was still in kindergarden. His sons continued practising at Saineikan almost daily up to and through junior high school (15 years old). In 1956, he took part in the 70th Imperial Guards shiai, which was marked as being the first tenran-shiai after the war. This story – which opened this article – continues below in the next section. Around these years he took part in two consecutive olympics as coach of the Japanese marksmanship team. A member of his team would get a medal in both competitions (more on this below). From the mid-60s Kozo became a highly sought after teacher, and took up kendo teaching posts at Tokyo University, Kanagawa prefecture kendo association, and the police academy, as well as other places. In 1969 he was appointed the leader of a group of sensei that travelled to Europe in order to popularise and spread kendo. He was influential in starting the European Kendo Federation and served as the vice president of the British Kendo Association for a time, and influenced a generation of Europe-based kenshi, not in the least France’s Yoshimura sensei. In July of the same year, just 2 months after receiving 9dan, he died of cancer. 70th Imperial Guards shiai, Showa 31 (1956). The first post-war tenran-shiai. As the final was happing I was speaking to Takizawa’s defeated partner from the prior round: “What about this Takizawa, he seems to have enough ability, but he’s unlucky in shiai and sometimes loses to people he’s stronger than?” He replied “If he thinks about that he’s done for.” Actually, looking at his kendo today there seems to be something different than usual. Watching the shiai now, you can see that this new flexibility has given him confidence… but we can’t forget the youthful vigour that makes Abe as strong as he is. “MEN-ARI” calls Mochida sensei; its Abe’s ippon. With Mochida sensei’s call of “NIHON-ME!” both kenshi press forward. Takizawa’s kiai is as load and strong as ever. The atmosphere in Saineikan is electric and you can see both competitors faces are red with concentration, almost as if they are on fire. As the match continues you can see that – whilst Takizawa remains concentrated – Abe’s tiredness shows through. Takizawa’s concentration is great. However, if things are left as they are, time will run out and he will lose. He pushes forward, advancing, pressuring Abe, who has now resorted to protecting himself more and more. “MEN-ARI” shouts Mochida sensei; with only seconds away from defeat Takizawa takes an ippon back to equalise the score. The shiai goes into encho, but Takizawa has already climbed over a difficult mountain to get this far, and is now going down the other side. Tired, Abe is continually on the defensive. Where did such energy come from such a short kenshi? Takizawa presses on his attack and attacks… KOTE! “KOTE-ARI” shouts Mochida sensei, and the winner is decided. Today was Takizawa’s victory. As everyone stood up for applause the kenshi bowed to each other then faced the emperor and empress. As they bowed low to them, the emperor and empress stand up to offer their appreciation. The time was 3:06pm, on 12th of May 1956. For two days and nights after winning the competition my sempai and my friends celebrated with me, and everything was like a dream. On the evening of the third day after the shiai, I got a call from the Police Medical Clinic asking me to come down immediately for a consultation. They didn’t say anything about holding any celebration for me, so I found myself standing in front of the doctor with a dubious look upon my face. A few days earlier had been our annual medical checkup and they had found something strange in the results. They showed me the x-ray from the day and tried to explain what they found: tuberculosis. I didn’t shrug off their explanations but I wondered if someone with such a disease could win a tenran shiai. I was shocked at what he was trying to tell me, but I didn’t say anything. With these words it was decided. Here was I, still drunk on the win of the tenran shiai a few days earlier suddenly yanked into a different world. I started thinking about my recuperation, my family, my job, etc and I realised I was buried in troubles. Four days before I had been called to the police bureau director’s office and was given a monetary gift for winning the tenran shiai. Now I went to the same bureau, and from the same director was ordered to take medical and recuperation leave. Most people who seriously study kendo have no interest in seeing the art as part of the modern olympics. Its surprising then to find that a hanshi 9dan like Takizawa Kozo sensei could be said to be the first – and possibly the only – person who coached someone using kendo pedagogy into getting an olympic medal. Only a week after winning the tenran shiai mentioned above, Kozo sensei came down with tuberculosis. After undergoing serious surgery and a year of rest, he restarted his work in the police as a teacher in the Education branch. Here they taught kendo, judo, taihojutsu, pistol, etc. Around that time the olympic rifle association of Japan contacted the police and asked them if they would be willing to train athletes for the pistol event of the olympics (pistols can only legally held by police in Japan). Despite there being no current programme for this in Japan, the police readily took up the task, and Kozo sensei was tasked with the job. Yoshikawa was selected for the Rome olympics in 1960. The pistol discipline requires athletes to shoot their 60 shots within 3 hours. After taking time and shooting about 30 shots, Yoshikawa wasn’t on good form. At that time an official slipped him a note: it was from Kozo sensei. Opening it, it read: “That was Musashi thinking.” With this one note from his coach, Yoshikawa took 4 or 5 breathes, relaxed himself, and re-focused. He came away with the silver medal in the event (it was the first time a Japanese person was awarded a medal in the event). In the 1964 olympics, the emperor came to watch the pistol event. Under pressure to perform Yoshikawa’s timing went astray. At that time the official slipped him a note: “That was Musashi thinking.” He imagined Kozo sensei berating him strongly: “Give up trying to get a medal? What the hell have you been trying so hard this last 4 years for anyway? You have 30 shots left; show them your true self.” Furukawa reports that he couldn’t remember anything about his last 30 shots. It was almost as if he were a robot. In what he claims is a miracle, he was awarded a bronze medal. Yoshikawa still has the note(s) that Kozo sensei passed to him. Since the young brothers practised kendo in the grounds of Edo castle (or what remained of it) it was easy for them to imagine the scenario. Put in kendo terms it means rather than relying on strength alone to attack your opponent straight on, you could seme kote and attack men, or seme men and attack dou, use small movements to seme but attack big, seme to the omote but attack to the right, etc. In other words, allow your body and spirit to move freely and at will. 1. Don’t think about winning, just fight with mushin. 2. Whatever happens don’t retreat. Look for the chance and attack. 3. Don’t even be defeated by your kiai, always have a loud shout. 4. If a shiai/fight is long and drawn out then attack with abandon (sutemi). Showa 62 (1987) – awarded 9dan (May); he died of cancer at the age of 76 (July). He was hanshi, kyudan. Permission was granted from Kozo sensei’s sons, Takizawa Kenji and Masaya sensei to write this article. Contents used with permission of Takizawa Kenji sensei. What Is the True Meaning Of Gratitude? Makes you think exactly where you and I fit into the kendo community and what our impact will maybe be. Having trained with Takizawa Sensei, who actually came to Edinburgh Kendo Club, this has a lasting effect on me about this gentle and gracious man. Thank you for posting. Coincidentally I was recently flicking through a copy of Mr Lidstone’s Introduction to Kendo and there are several pictures of and credits to Takizawa Kozo sensei. I knew about his influence on British and European kendo but was unaware of his track record in Japan until I read your post. Cheers! I think there are a few sensei who have been to or been involved with foreign kendo without their full resume being known. I have a digital copy of that book and have been thinking about providing it online for download. Maybe sometime in the future. Thank you very much George. Takizawa Kenji sensei recently visited Melbourne, Australia and I had not idea of the history behind this humble and skilled sensei. I find it amazing how even a 9th dan sensei has applied kendo principles to a different sport. Much food for thought indeed. Thank you very much again!!! Cheers! Yeah, Kenji-sensei himself has said that the article has been a great help to him as he doesn’t have to attempt to explain his background through translation now!!! Absolutely fantastic quote. I want this on a tenagui!!!!! George, just got around to reading through this old article. Great piece. I will soon hope to practice with Takizawa Kenji sensei as I have been invited to the Atsugi International Kendo Festival by my good friend Fujiwara Masaru sensei at the end of October (2014). Thanks for the insight into Takizawa Kozo and the roots of Takizawa Kenji’s lineage. Yeah, Takizawa sensei himself said the article was useful as he could just direct people to it and it would explain some of his background!!! The Atsugi thing was kind of mentioned to me, but it’s not really my scene. I hope you are planning to pop over to the more interesting part of the country while you are here as well. 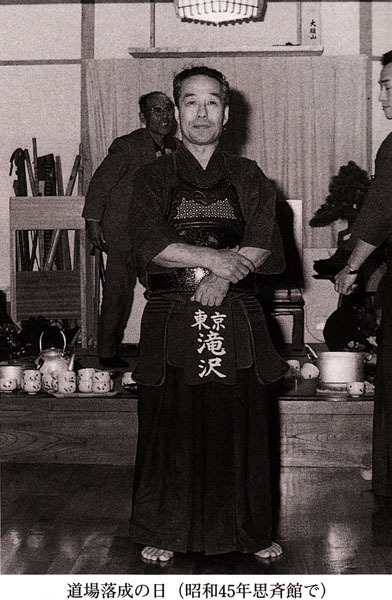 Takizawa Kozo Sensei was the group leader for Team Japan at one of the early World Kendo Championships. I met him at that time and remember that he was a very nice person. Lately I’ve come across a lot about him incidentally … anecdotes from Shidogakuin plus Ogawa Chutaro sensei mentions him in passing now and then. His son has been one of my teachers for almost a decade now.